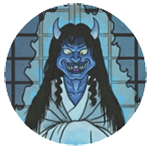 APPEARANCE: Hōnengame are aquatic yōkai with fortune-telling abilities who live deep in the seas around Japan. They have the bodies of large turtles, with broad, hairy tails protruding from their shells. They have the heads of human women with long, flowing black hair. They often have horns sprouting from the tops of their heads. BEHAVIOR: Hōnengame spend most of their lives deep in the sea, away from human activity. They rarely every appear before humans, coming to shore only when they have an important message to deliver. INTERACTIONS: Hōnengame approach humans in order to give predictions and prophecies. Usually they foretell great harvests, which is why they are called hōnengame. They may also warn of coming epidemics, droughts, famines, and other disasters. Like amabie, jinja hime, and other prophetic seafaring yōkai, their image was believed to have powerful protective abilities. Hōnengame illustrations printed in newspapers or sold as talismans and charms were believed to ward against disease and evil spirits. ORIGIN: Hōnengame were first recorded in the Edo Period. 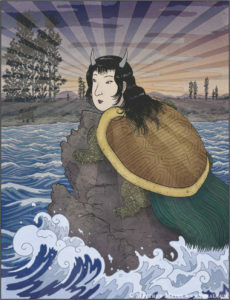 In 1669, a hōnengame appeared on the shores of Echigo Province (present day Niigata Prefecture). Its body glowed brilliantly, which attracted a number of people. As they approached, the creature spoke to them. It foretold a bumper crop which would be followed by an epidemic. It also informed the people that if they were to hang its image in their homes and pray to it morning and night, they would avoid getting sick. Then the hōnengame slipped back into the sea and was not seen again. A newspaper from 1839 describes that on the 14th day of the 7th month, a hōnengame was captured alive by fishermen in Kishū (present day Wakayama and Mie Prefectures). It was recorded as having a girth of 5.5 meters and a length of 1.71 meters.